Our company has established a progressive infrastructure, where we execute our complete business operations in best possible way. We have segregated it into numerous departments, which include production, designing, sales and marketing, quality control, warehousing and packaging, research and development, logistics, administrative and many others. Moreover, we never compromise with our products' quality and therefore make sure to provide only top-quality range at our patrons. Under the unceasing supervision of our mentor Mr. Nikunj Shah (Proprietor), we are able to sustain market competition. His vast knowledge in this domain has empowered us to serve our patrons with superior quality products. We consider in making mutually beneficial and long term relationship with our patrons by providing them world-class quality product range at inexpensive rates. Due to our spacious warehousing unit and huge production capacity, we have been able to provide these products in bulk quantities. We have earned vast client base owing to our capability to meet the bulk orders within the assured time-restriction. Being a quality-conscious firm, Bansal Sales Agency stringently follow various in-house quality assurance procedures from obtaining of the raw material to the final dispatch, in order to make sure a defect-free range. For well-timed delivery of the offered products at the patrons’ end, our company has established wide distribution network. Since our inception, we always keep an eye on industry laid standards and guidelines and offer products accordingly. Thus, we ascertain ourselves by offering superior-quality products that are in compliance to the customer’s necessities. Our competent and trained quality professionals always struggle to preserve global quality guidelines for our products on several parameters such as durability, strength and performance. Moreover, to match the quality standards, our professionals use only premium-grade raw material in our fabrication process. We are offering a wide range of control panel accessories, switchgear products, electrical components and parts. To cater to the varied requirements of our clients, we have developed vast associations with globally renowned companies. 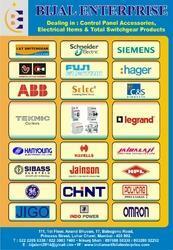 We are approved stockiest and supplier of electrical products by.